Yes, a little unnecessarily wordy. Yes, not entirely excellent English. And perhaps the curators mistook the word activism for some long lost -ism of art history? Activism is not in fact a historical notion. Political art perhaps? The kind of didactic, mystery-less, bra burning political art of the 1970s that we all learnt about in art school? Yes, well, that is history. So the question needs to be asked. 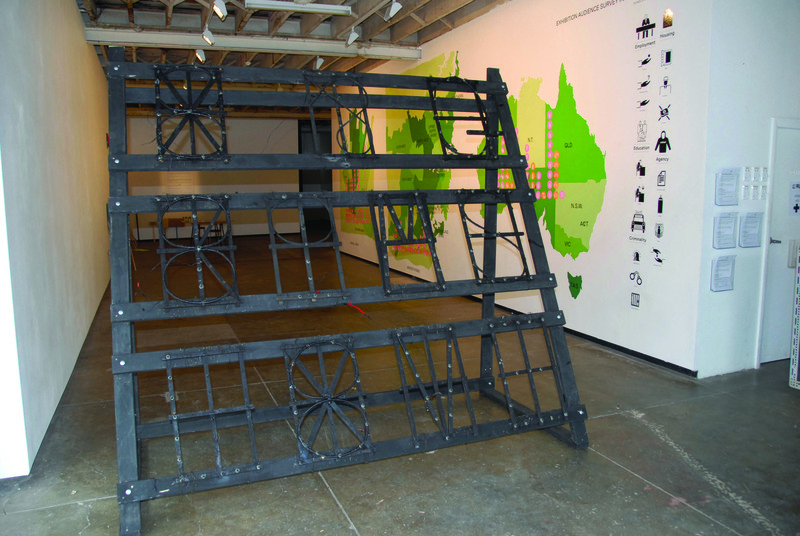 Why attach a political exhibition to an ARI symposium? Having been a director of an artist-run initiative I can safely claim that that role does come complete with feelings of fighting the good fight. One can feel overwhelmed by the constant appeal to funding bodies, the wider non-art community and basically, all and sundry. We. Are. Here. Goddamn. You. Yet, unfortunately on the whole, this particular exhibition appears to have fallen somewhat flat. I think perhaps the paralysis of anxiety never enabled the artists to move beyond their own lack of opinions on the subject. This is, nonetheless an interesting exploration. In the wake of an art school education filled with the notion that political art is naff, literal and icky, how does one navigate art making that negotiates change? Due to the limited space available here, I will attempt to deconstruct this issue through two of the works in the exhibition. The first, a work which illustrates this so-called paralysis and the second, a work where the artist capably moved beyond this state of seizure to produce a poetic and informed piece. 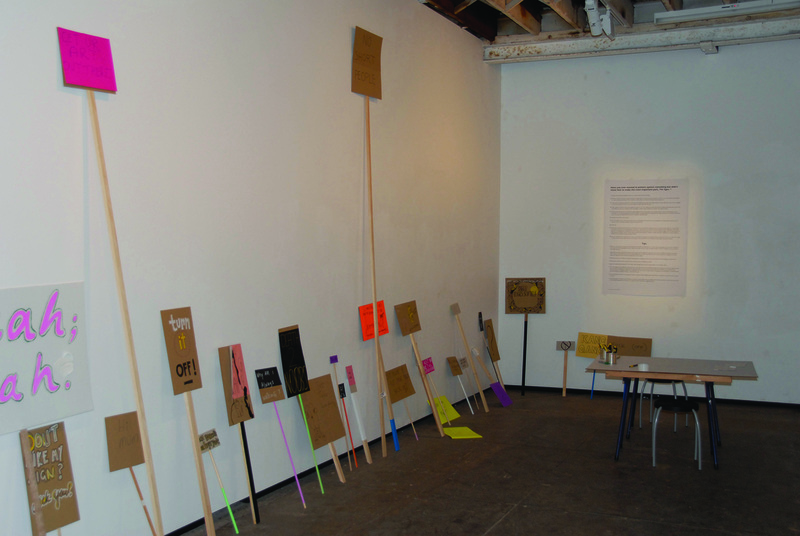 Unworkable Action (2011), a make your own protest placard installation by Nervous Systems, the collaborative work of Brisbane-based artists, Rachel Haynes and Alice Lang is by no means the only guilty party in this exhibition but unfortunately this work is a prime example of exactly the problems inherent in audience participatory work where the artist remains visually and emotionally absent. 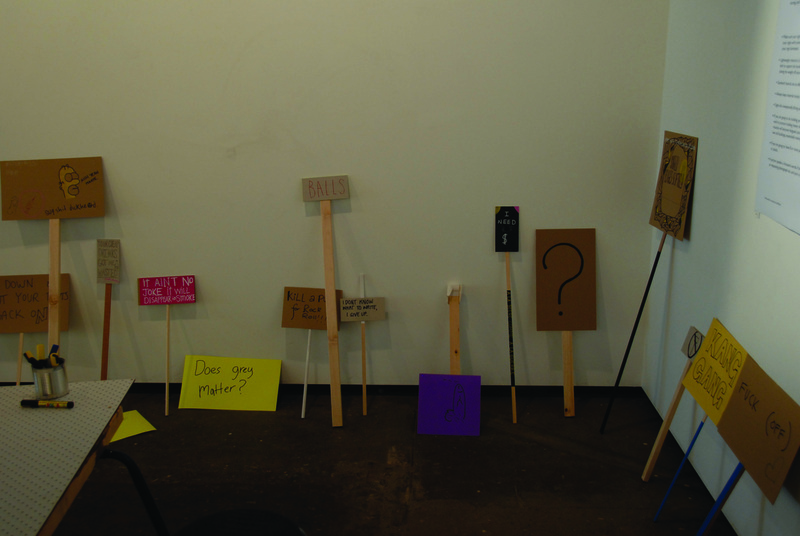 Of course, all of the placards were remnants from the opening night and unfortunately mostly gave proof to the stereotype of the drunken, apathetic art school kid. Quite frankly, the television program A Current Affair could have taken a vox-pop at a mid-week Sydney art opening and garnered the same responses. So what is the problem here? Namely, it is literally an unworkable action. By including the community-edited instructions from wikiHow and prompting the gallery audience to have their say Nervous Systems only present us with a notion of one niche community’s nonchalance and tortuous civilian directions. When you put it to the people, what do you get? In essence, a shrug, and an inefficient shrug at that. And although this work is based in reality, I don’t think it effectively mirrors the Australian socio-political landscape. Australians are not the apathetic, non-political people of the long-held archetype of history. You only have to tune your television in to Q&A once a week to know that. Unworkable Action unfortunately comes across as incredibly lazy work and indicative of an insular perspective born out of an immature and short-lived thought process. Can we safely blame bad work on a paralysis of anxiety? In part, yes. It would appear that the artists behind this work have been so frozen by their own attempts to create non-dogmatic political work they have, in fact, said nothing. They have not subverted the protest march or the tool of the protest, the placard. In their failure, they have only blatantly revealed their own failings as artists, namely that they are scared of getting it wrong. At the other end of the spectrum we see the result of an artist who competently resolved her own anxieties by honestly reflecting upon her own experiences. Michaela Gleave’s work, It was never meant to last (BIG TIME LOVE) (2011), was a four-metre pine structure that dynamically bridged the divide between ephemeral performance and detritus sculpture post-performance. 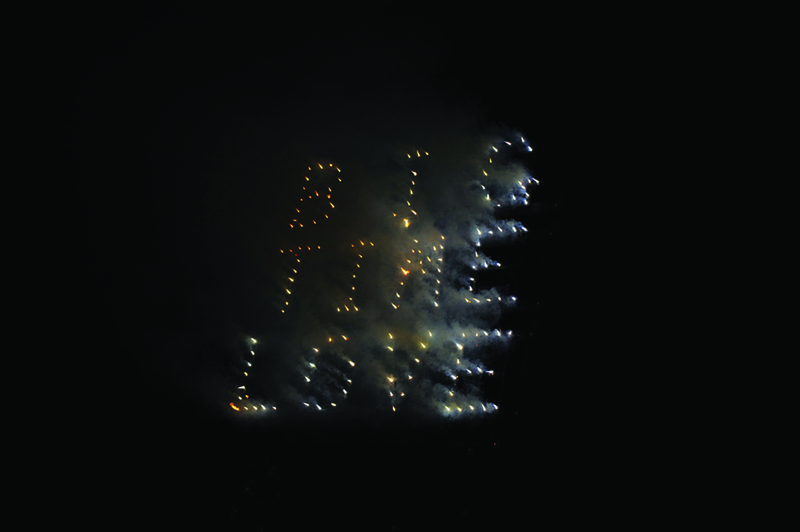 On opening night the piece was located in Prince Alfred Park opposite the gallery where Gleave performed a pyrotechnics show that fizzed and fizzled over a one-minute period to reveal three words. Big. Time. Love. As a work produced in conjunction with an ARI symposium, I think Gleave has successfully nailed that great emotion radiating from the emerging arts community. And anyone who has ever spent time as an ARI director knows that with all that toil comes big time love. Otherwise, who would be so stupid to work long hours, for free, for years? Gleave’s work is deceptively simple. It is not just a neon embrace, plugged into the wall pulsing for the duration of the exhibition. Rather, it is a temporal performance that works equally as a performance in the present as it does as burnt-out debris post-performance, where the charred edifice appears as the ghost of all ARIs past. And further, the work expands ad infinitum, the light of BIG TIME LOVE forever swelling through time and space. One small mark on history. It was never meant to last. In a world of endless, accessible information, it can be overwhelming to process all sides of an argument in a bid to create work that challenges the status quo. At the end of the day, artists are the remaining creatures with the luxury to spend time. To research, to process, to form opinions that aren’t based purely on twitter grabs or news headlines. Our time is not monetised—we don’t make any money. And that is actually an incredible gift in the 21st century. Spend it wisely. 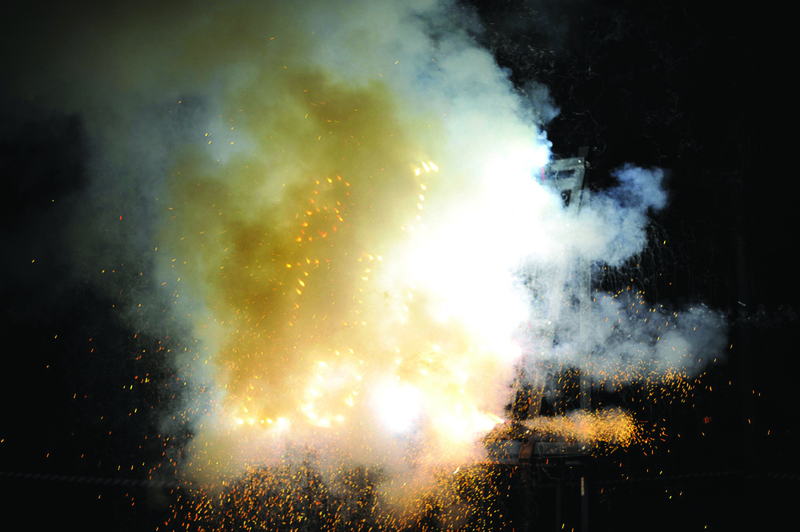 Michaela Gleave, It was never meant to last (2011), one-minute event, 4 x 3 x 2m, pyrotechnic flares, pine. 1. Munting, B. & Meagher, G., ‘Day 1: 1 September, 2011. 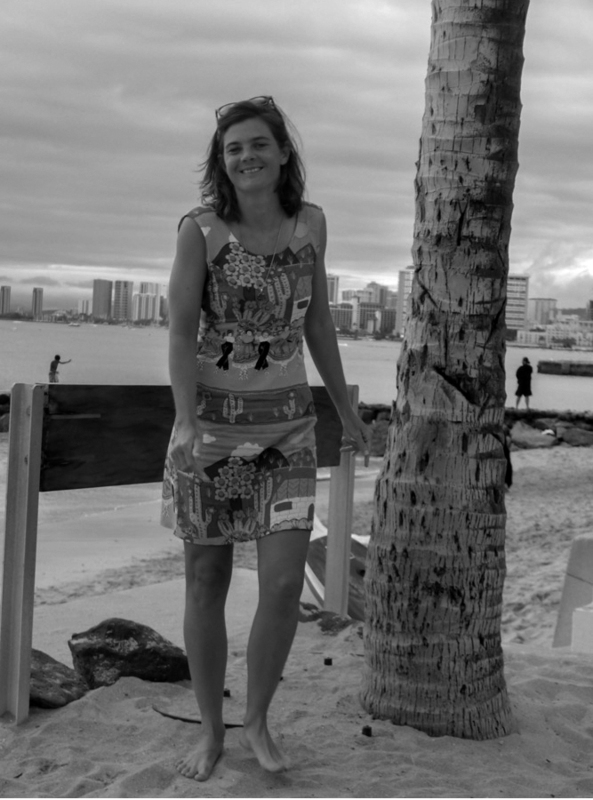 The feeling will pass…’ in We Are Here, symposium program, (Sydney: NAVA and Firstdraft, 2011), 7.